mixedbag February 14, 2015 May 27, 2016 No Comments on Love is in the air! Happy Valentine’s day, everyone! I love this day, whether I get flowers or not 🙂 For the last few years, I’ve been making desserts for S, my husband. Last year, it was chocolate mousse. This year, I made a little ‘pick-me-up’ for the hubs. I made tiramisu (get it? no? well, tiramisu means ‘pick-me-up’ in Italian). 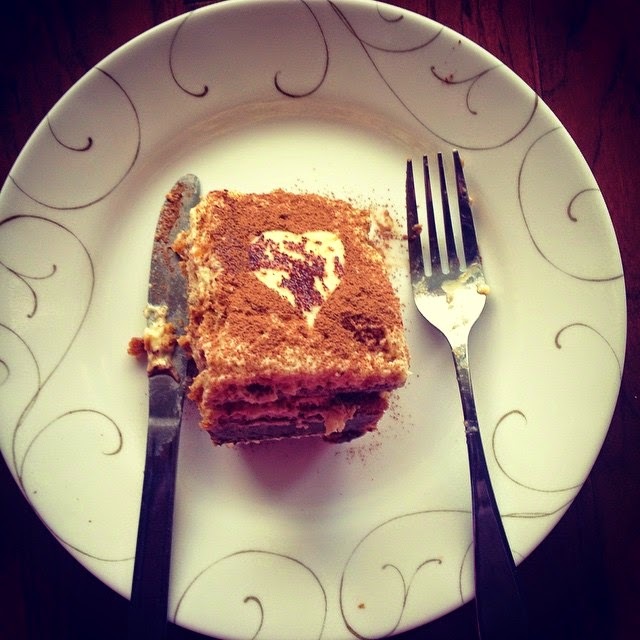 Tiramisu has to be one of my favourite desserts of all time. It combines my favourite flavours – chocolate and coffee. Anybody who knows me knows that I cannot live without coffee. So, Tiramisu! Ofcourse, hubby loves it too, not that I made it for myself hahaha! I found this wonderful recipe on Pinterest. The reason I chose this one over the others is that it does not use heavy cream. It uses egg whites instead to make the tiramisu light and fluffy.